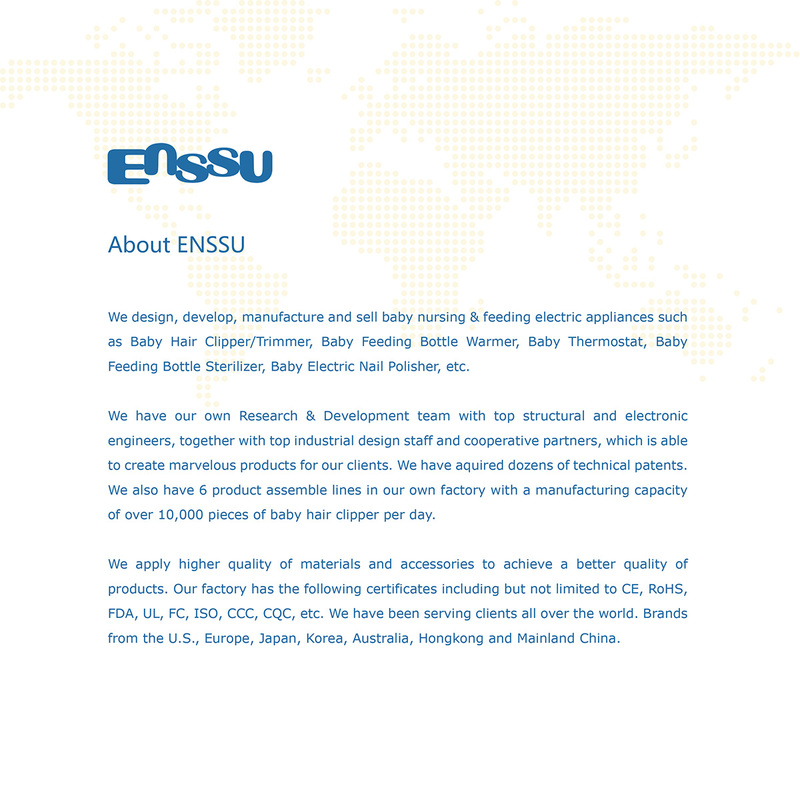 Enssu design, develop, manufacturing and selling baby nursing & feeding electric appliances such as Baby Hair Clipper/Trimmer, Baby Feeding Bottle Warmer, Baby Thermostat, Baby Feeding Bottle Sterilizer, Baby Electric Nail Polisher, etc.We have many OEM&ODM experience for our global customers. 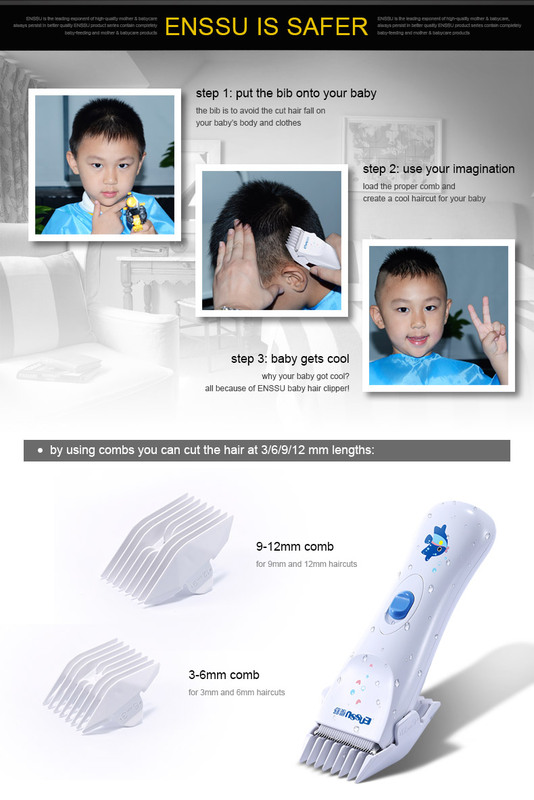 Today Enssu will tell you how to choose the right baby hair clipper and baby hair trimmers for your infant and kids. Cutting kids’ hair using scissors is not easy since they tend to move around. So, what is the easy way out then? You can buy baby hair clippers. They are necessary to cut young kid’s hair. You can find a myriad of hair clippers on the market these days. Most mothers use the same trimmer for both kids and adults. Some opt for big trimmers that have a lot of attachments. Some people choose a hair trimmer based on the popularity of a brand, while others opt for the cheapest model. Given below are a few tips that may help you buy the right one. First off, the brand is a factor that mothers should take into account when opting for a hair trimmer. Since you will be using the product for a long period of time, make sure you make the choice carefully. Usually, top brand tends to stand the test of time. They are worth the extra cost. Typically, top brands offer a host of features. These products don’t make too much noise so you can cut your baby’s hair even when it’s sleeping. Moreover, these machines are fast. The job won’t take more than 5 minutes. Since hair clippers are aimed at barbers, you can use them to make as many hairstyles as you like. Mothers can make use of hair clippers to cut their kids’ hair from the comfort of their homes. They won’t need to head to the salon anymore. These products offer excellent features like high safety, ease of use, compact design and quiet operation. Although most products are electricity-operated, you can recharge the device and use it as many times as possible. Since these products are compact, you can easily carry them around wherever you want. You can trim the hair of your baby while it’s sleeping as the unit makes very low noise. The good thing about buying a baby clipper is that you can save a lot of money as you won’t need to go to the salon. This can save you a lot of time and money. As a matter of fact, these hair trimmers are safe for kids of all ages. The easy operation and simple design make it easier for you to hold the machine and make the hairstyles you want. It’s easy to recharge these units. Most of the devices don’t take more than 10 hours to recharge. Once charged, you can use it for up to 60 minutes. So, one charge may last around an hour. So, make sure the unit you are going to buy has a powerful motor. If the motor is weak, it won’t be able to do the job properly. Long story short, if you are looking for an easy way of trimming your baby’s hair, we suggest that you opt for a good quality baby hair clipper. This device will make your life a lot easier. If you are looking for a baby hair clipper, we suggest that you check out a variety of hair clippers on Enssu at https://www.gzenssu.com .